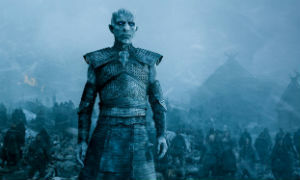 Data published by piracy monitoring firm MUSO suggests that the seventh season of Game of Thrones was pirated more than one billion times. Most of the traffic was generated by unauthorized streaming services, with torrent and direct downloads accounting for just a small piece of the pie, roughly fifteen percent. The seventh season of Game of Thrones has brought tears and joy to HBO this summer. It was the most-viewed season thus far, with record-breaking TV ratings. But on the other hand, HBO and Game of Thrones were plagued by hacks, leaks, and piracy, of course. While it’s hard to measure piracy accurately, streaming in particular, piracy tracking outfit MUSO has just released some staggering numbers. According to the company, the latest season was pirated more than a billion times in total. To put this into perspective, this means that on average each episode was pirated 140 million times, compared to 32 million views through legal channels. The vast majority of the pirate ‘views’ came from streaming services (85%), followed by torrents (9%) and direct downloads (6%). 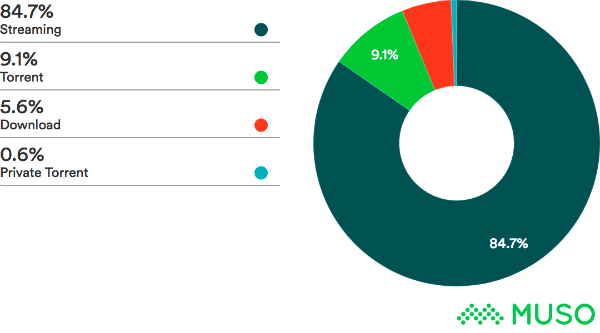 Private torrent trackers are at the bottom with less than one percent. Andy Chatterley, MUSO’s CEO and Co-Founder, notes that the various leaks may have contributed to these high numbers. This is supported by the finding that the sixth episode, which leaked several days in advance, was pirated more than the season finale. “It’s no secret that HBO has been plagued by security breaches throughout the latest season, which has seen some episodes leak before broadcast and added to unlicensed activity,” Chatterley says. In addition, the data shows that despite a heavy focus on torrent traffic, unauthorized streaming is a much bigger problem for rightsholders. Although the report shares precise numbers, it’s probably best to describe them as estimates. The streaming data MUSO covers is sourced from SimilarWeb, which uses a sample of 200 million ‘devices’ to estimate website traffic. The sample data covers thousands of popular pirate sites and is extrapolated into the totals. While more than a billion downloads are pretty significant, to say the least, MUSO is not even looking at the full pirate landscape. For one, Muso’s streaming data doesn’t include Chinese traffic, which usually has a very active piracy community. As if that’s not enough, alternative pirate sources such as fully-loaded Kodi boxes, are not included either. It’s clear though, which doesn’t really come as a surprise, that Game of Thrones piracy overall is still very significant. The torrent numbers may not have grown in recent years, but streaming seems to be making up for it and probably adding a few dozen million extra, give or take.